The region's older and blue-collar voters have stuck with Democrats longer than their counterparts elsewhere. But how long can that last? With Democrats consistently strong along the East Coast and West Coast, Republicans dominant in the South and much of the Great Plains, the two parties now often fight most fiercely over a band of burly states that run west from Pennsylvania into Ohio, Wisconsin, and Michigan, and then Iowa. Ohio in particular is often seen as the decisive prize in the race for the White House: since World War II, it has voted for the winner in every presidential election except 1960. (The slight asterisk is that in 2000, Ohio voted for George W. Bush, who won the Electoral College and the presidency, but lost the nationwide popular vote.) Only Florida in recent years has attracted as much consistent attention from the two parties. Validating this reputation, these five Rust Belt swing states have measurably shifted their presidential allegiance over the past two decades. In the period when the GOP presidential candidates won the popular vote in five of the six presidential elections from 1968 through 1988, these states tilted solidly toward the GOP. Over those six elections, the Republican nominee carried Ohio, Michigan, and Iowa five times, and Wisconsin and Pennsylvania four times. Over those six elections, the GOP nominee averaged 50 percent of the vote or more in all five states. But since 1992, when Bill Clinton carried all five, these states have flipped their presidential leanings. Pennsylvania, Michigan, and Wisconsin are part of the "blue wall": the 18 states that have voted Democratic in all six presidential elections since 1992. Democrats have also carried Iowa in five of the past six elections (losing only to George W. Bush in 2004) and Ohio in four of six. The results in these states (particularly Ohio and Wisconsin) have often been close either way. But since 1992, it is Democrats who have averaged at least 50 percent of the vote in each of these states except Ohio. Collectively these states offer a substantial haul of Electoral College votes: Pennsylvania (20), Ohio (18), Michigan (16), Wisconsin (10), and Iowa (6). Despite their presidential success, Democrats face a much more challenging environment down the ballot. Republicans hold both state legislative chambers in all five states (except the Iowa state Senate), and the governorship in each of them except Pennsylvania (which last fall elected Democrat Tom Wolf). The balance is more even in the U.S. Senate: Ohio, Pennsylvania, and Wisconsin split their two seats between the parties, while Republicans hold both seats in Iowa, and Democrats hold the two in Michigan. In the U.S. House of Representatives, Republicans hold most of the seats in all five states, and a resounding cumulative advantage of 42-18. It's possible that the Republican governors of Wisconsin (Scott Walker) and Ohio (John Kasich) could seek the 2016 GOP presidential nomination. Historically, the Rust Belt was viewed as a political barometer because it encapsulated many elements of American life. And even today, these states blend the urban with the rural, the industrial with the agricultural. But by remaining largely unchanged, these states have diverged in important ways from a reconfiguring America. They are less racially diverse than the nation overall, and their nonwhite populations are heavily concentrated among African-Americans; the new minorities of Hispanics and Asian-Americans driving so much of the population growth elsewhere are only starting to make their presence felt across this landscape. None of these five states rank in the top half of states in the share of their population that was born abroad. Overall population growth is lagging in these states, especially compared with the fast-growing new political battlegrounds across the Sun Belt. From 2000 to 2013, Wisconsin experienced the most population growth of the Rust Belt swing states, and yet its increase of 7.1 percent still ranked only 35th among all the states. Iowa (5.6 percent growth and a ranking of 37), Pennsylvania (4 percent growth and a ranking of 42), Ohio (1.9 percent growth, and a ranking of 48), and Michigan (0.4 percent decline, and dead last) all trailed. While job growth has revived across the region, the scars of manufacturing decline since the 1970s and the resulting strains in blue-collar lives still heavily shape its politics. President Obama's campaign effectively tapped that legacy in 2012 with ads that portrayed Republican Mitt Romney as the embodiment of the corporate decisions that have resulted in decades of deindustrialization in gritty places like Youngstown and Flint. That history helps explain one of the region's most distinctive political characteristics: Working-class and older whites have proven more willing here than almost anywhere else to continue voting for Democratic presidential nominees. Against a backdrop of economic decline, traditional populist and lunch-bucket Democratic arguments have shown more staying power with those voters in these states than almost any others. Perhaps the critical question for the region's electoral future is how long Democrats can maintain that connection at a time when older and blue-collar whites in many other places have stampeded decisively into the Republican camp. Ohio: Racial change has unfolded relatively slowly here. In 1980, whites constituted 91 percent of Ohio's eligible voters; by 2012 that number had declined only to 84 percent. The States of Change model forecasts the white share to tick down to 83 percent in 2016, and then continue on a relatively unhurried decline to 76 percent by 2040. The pace of change in the actual voting pool hasn't been much different: Whites represented 91 percent of voters on Election Day in 1980, and 83 percent in 2012. From 1980 through 2012, African-Americans edged up from 9 percent to 11 percent of eligible voters. With improved turnout efforts, blacks grew faster over that period as a share of actual voters, from 9 percent to 13 percent. Looking forward, the model projects them to increase only slightly to 14 percent of eligible voters through 2040. 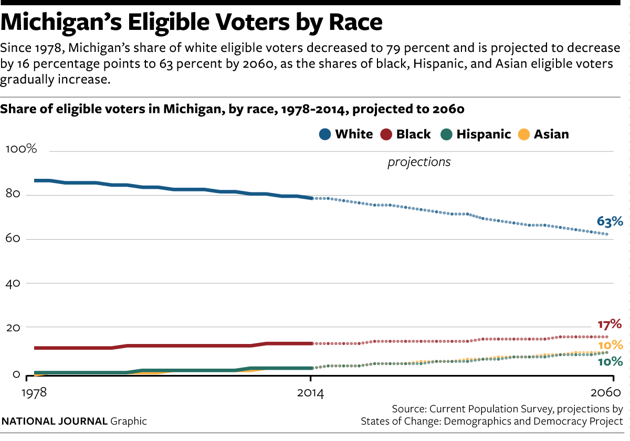 Hispanics and the category of Asian, mixed-race, and other adults, each constituted just 2 percent of eligible voters in 2012, but the model projects these groups to gradually rise to 5 percent each by 2040. Those changes could amount to a (very) slowly intensifying thumb on the scale for Democrats in the state. Since 1996, according to exit polls, the Democratic share of Ohio's white vote has varied only from a low of 41 percent (for Obama in 2012 and Al Gore in 2000) to a high of 46 percent for Obama during his first victory. As in other states, Democrats under Obama achieved overwhelming margins among African-Americans: In each of his campaigns he carried 96 percent of them in the state. In 2000 and 2004, when Bush carried the state, Democrats had won 89 percent and 83 percent of blacks respectively. Pennsylvania: Racial change has also proceeded slowly here. From 1980 through 2012, whites declined as a share of eligible voters from 92 percent to 83 percent. But in the actual voter pool, the change was even more modest: from 91 percent in 1980 to 85 percent in 2012. African-Americans were 9 percent of actual voters in 1980 and 10 percent in 2012. Hispanics, Asian-Americans, mixed race, and others have barely established a beachhead in the state: too small to measure in 1980, those groups accounted for 4 percent of the actual (and 7 percent of the eligible) vote by 2012. The States of Change model projects a comparable rate of change rolling forward. It forecasts the white share of eligible voters to drop only another percentage point in 2016 (to 82 percent) and to recede slowly to 72 percent by 2040. It projects African-Americans to remain steady at 10 percent of eligible voters for the next several years before rising again toward 12 percent by 2040. By then, the forecast expects bigger change for Hispanics (rising to 10 percent of eligible voters by 2040) and Asians and others (reaching 6 percent.) But in the near term, it expects only minimal growth for the two groups, from 7 percent of the combined eligible voter population in 2012 to 8 percent in 2016 and 2020. In presidential elections, the Democratic vote among Pennsylvania whites has been remarkably steady all the way back to 1988, according to exit polls. Al Gore won 48 percent of whites in 2000 and Obama won 47 percent in 2008, but in the other five elections, the Democratic share varied only between 42 percent and 45 percent. In his 2014 victory, Democratic Gov. Tom Wolf did better, reaching exactly 50 percent. As in other states, Obama twice pushed up the Democratic margins among African-Americans above 90 percent, exceeding the party's advantages over the previous two decades. Looking forward, the model sees the contraction of the white vote somewhat accelerating in the near term—down to 77 percent by 2020 and then 70 percent by 2040. It sees no near-term increase for African-Americans, and even by 2040, a rise only from the current 14 percent of eligible voters to 16 percent. The model anticipates the biggest growth among Hispanics and the combined Asian and other category (with each group rising from 3 percent of the eligible population in 2012 to 4 percent by 2016 and 7 percent by 2040). As elsewhere, under Obama, Democrats have consolidated their support among African-Americans, from around 90 percent in 2000 and 2004 to 96 percent and 95 percent in the past two elections, exit polls found. Although figures for 2012 were not available, Democrats also carried about three-fifths or more of Michigan Hispanics in each election back to 1988. And in contrast to most other states, Democrats have somewhat improved their performance among whites here. The party's nominees carried 39 percent of whites in both the 1988 and 1992 elections. But in the five elections since, the Democratic nominee has won between 43 percent and 46 percent of Michigan whites, except in 2008 when Obama carried a plurality with 49 percent. In 2014, exit polls found that Democrat Gary Peters, who won the Senate election, ran exactly even among whites, making him one of the party's few Senate and gubernatorial candidates anywhere who did not lose this bloc. Democrats have competed as well here with whites as almost anywhere. Their presidential nominees carried Wisconsin whites in 1992, 1996, and 2008, and lost them by no more than 4 percentage points in the other four elections since 1988. Combined with their strong performance among African-Americans—which surged past the 90 percent mark under Obama—that's allowed the party to carry the state in all seven of those elections, albeit sometimes narrowly. 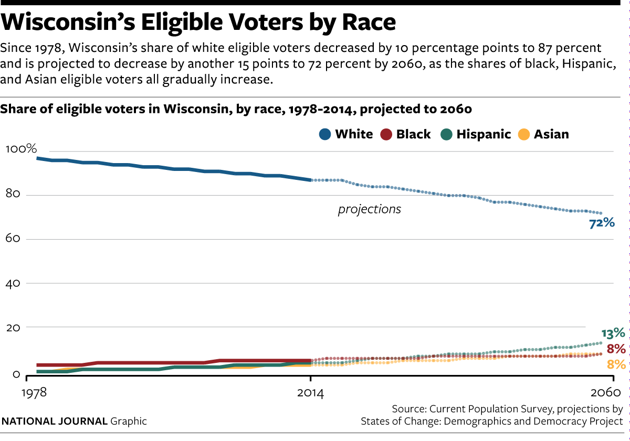 Still, Wisconsin has not been entirely immune to the shifts among whites under Obama evident elsewhere: In his 2014 reelection, Republican Gov. Scott Walker held Mary Burke, his Democratic opponent, to just 42 percent among them. Iowa: With its caucuses that begin the presidential nominating process every four years in picturesque small towns and farm communities, Iowa often seems immune to racial change. Yet change is coming even here. In Des Moines, the state's largest city, a majority of the students in the public school K-12 system are now nonwhite. But it will take time for that diversity to be felt in the state's political balance. 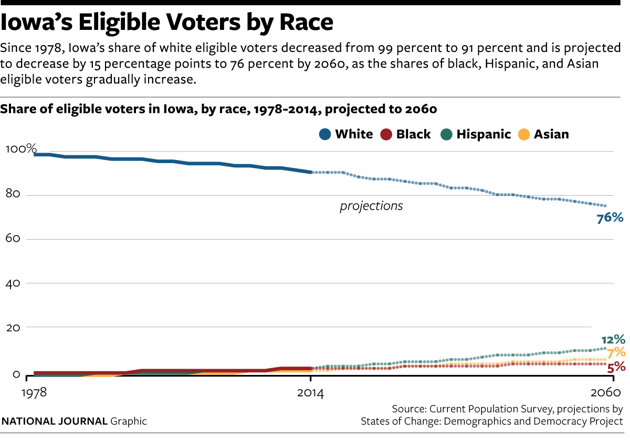 In 2012, 92 percent of Iowa's eligible voters were white. That was down from the 99 percent in 1980, but still higher than any other Rust Belt battleground. Looking forward, the model projects whites to recede only slowly to 91 percent of eligible voters in 2016 and 83 percent in 2040. The model projects that even by 2040 African-Americans will represent only 4 percent of eligible votes (up from 3 percent in 2012). The forecast expects more change among Hispanics (up from 3 percent of eligible voters in 2012 to 4 percent in 2016 and 8 percent by 2040), as well as the category of Asian-Americans, mixed-race, and others. That group is now 2 percent of the eligible population and is projected to reach 5 percent by 2040. The challenge for Democrats is to build the machinery to drive turnout in a state with no tradition of mobilizing minority communities. As in Wisconsin, Democrats have maintained their presidential-level competitiveness among whites as well here as almost anywhere. The party's presidential nominees have carried them in four of the past six elections, and reached 48 percent in each of the two they didn't (both against George W. Bush in 2000 and 2004). The small African-American population has provided a small boost that has helped Democrats carry the state in five of the past six presidential contests; over time, Hispanics, Asians, and others could extend that advantage, albeit very slowly. In the 2014 Senate race, Republican Joni Ernst held Democrat Bruce Braley to just 43 percent among whites en route to her decisive victory. 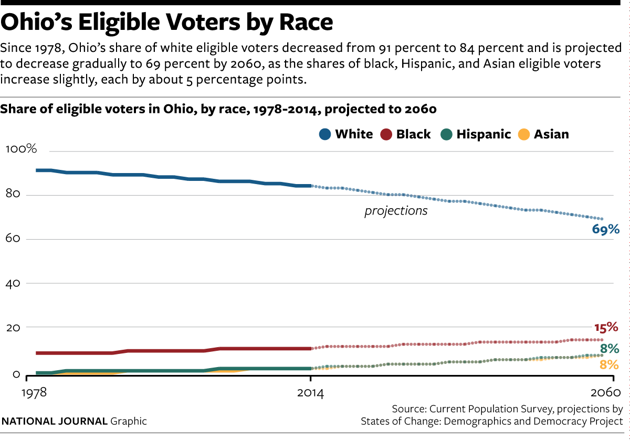 Ohio: Working-class whites are shrinking as a share of the electorate but more slowly here than in most places. In 1980, white men and women without a four-year college degree accounted for 78 percent of eligible voters; by 2012 they still represented 64 percent. In terms of actual voters, they have contracted from 73 percent in 1980, but still accounted for 59 percent in 2012. College-educated whites have increased over that period but reached just one-fourth of actual voters by 2012, according to the census survey; the biggest increase came among the college-educated white women (who roughly doubled from 7 percent to 13 percent of voters from 1980 through 2012). Since 1996, white men in Ohio have proven more volatile in their voting preferences than white women. In the five presidential elections since then, Democrats have carried between 47 percent (in 2004 and 2012) and 52 percent (2008) of college-educated white women. Critically, Democratic nominees have run slightly better here than in most other places among white women without a college education: except for John Kerry, who carried only 41 percent of this group in the security-focused election of 2004, Democratic nominees have carried either 44 percent or 45 percent of noncollege white women in the other four elections since 1996. Republicans have carried Ohio's noncollege white men in each election since 1992, but their margins have varied considerably. Obama won 44 percent of this bloc in 2008 and just 39 percent in 2012—modest numbers but, as with blue-collar white women here, just enough above his national performance to help secure the state. Except for Obama's first race, college-educated white men here have broken more decisively for the GOP in recent elections: Bush carried 71 percent of them in 2000 and 62 percent in 2004, and Romney won almost two-thirds in 2012. Obama in 2008 did best, losing this group by just 5 percentage points. 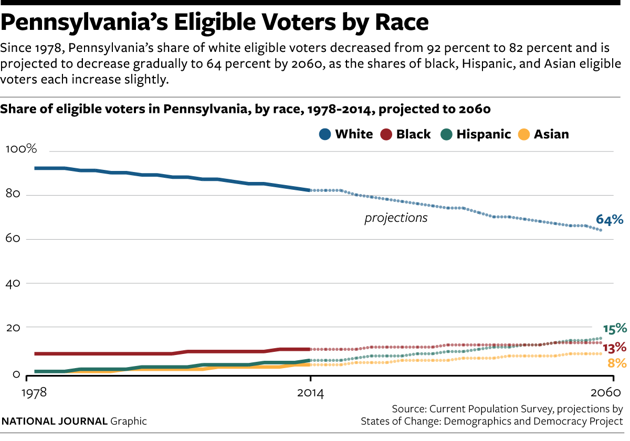 Pennsylvania: In 1980, whites without a college education represented almost exactly four-fifths of eligible voters; by 2012, they had fallen to exactly three-fifths. Their share of actual voters comparably declined over that period from 74 percent to 54 percent. In turn, college-educated white men have enlarged their role (from 7 percent to 11 percent of eligible voters, and 10 percent to 15 percent of actual voters) while college-educated white women have surged. From 1980 through 2012, these women more than doubled as a share of both eligible voters (from 5 percent to 13 percent) and actual voters (from 7 percent to 16 percent). Republicans have carried Pennsylvania's noncollege white men in each of the past five presidential elections, and by crushing margins in each of the past three. (Obama won just 36 percent of them in 2008 and 39 percent in 2012.) And Republicans have also generally dominated among Pennsylvania's college-educated white men: Apart from 2008, when Obama split them about evenly with John McCain, no Democrat has exceeded 39 percent with college-educated white men since Clinton in 1996. But Democrats are benefiting from the growing number of college-educated white women: The party carried this group in 2000, 2004, and 2008, before Obama slipped back to 44 percent with them in 2012. As in Ohio, another key to the Democrats' presidential success in Pennsylvania is their ability to significantly exceed their national performance among white women without a college education. In Pennsylvania, Democrats carried these blue-collar women in each of the three elections from 1992 to 2000, and have lost them only narrowly in the three elections since, reaching at least 46 percent of the vote each time. Michigan: The decline of noncollege whites has followed a similar arc in this state that long symbolized blue-collar life. In 1980 whites with less than a four-year college education represented about three-fourths of both eligible and actual voters; by 2012, they had fallen to about three-fifths of eligible voters and 55 percent of the actual voting pool. College-educated white men filled some of that gap (rising from 7 percent to 10 percent of eligible voters and from 9 percent to 13 percent of actual voters). But as in many other places, the biggest gains came among college-educated white women, who jumped from 4 percent to 11 percent of eligible voters (and exactly doubled from 7 percent to 14 percent of actual voters). In 2012, Obama ran better among those well-educated white women than any other group of whites: He split them 50-50 with native son Mitt Romney; Democrats also carried them in three of the previous four presidential elections. As elsewhere, college-educated white men here lean solidly Republican: The GOP has carried them in each presidential race since 1988, and Obama drew only 39 percent of them in 2012. Critically, though, the large labor-union presence and an enduring receptivity to class-conscious economic appeals have allowed Democrats to retain a foothold with the white working class in the state generally considered the birthplace of blue-collar "Reagan Democrats." Although Republicans have carried Michigan's white men without a college degree in the past six elections, Democrats have won a competitive 44-46 percent of them in the past three. Democrats have also carried white women without a college degree in four of the six races since 1992, although Obama slipped to 44 percent last time. Wisconsin: As in the other Rust Belt battleground states, working-class whites have receded here, but they remain more prominent than elsewhere. Whites without a college degree were 81 percent of eligible voters in 1980 and 62 percent in 2012; in the actual voter pool they fell from 78 percent to 57 percent. College-educated white men have increased from 8 percent to 13 percent over that period among eligible voters, and their female counterparts have grown even more dramatically, from 6 percent to 14 percent of the eligible population. In 2012, the college-educated white women (at 17 percent) exceeded the college-plus white men (at 15 percent) in the actual voter pool. Following national patterns, Democrats have run best here among those college-educated white women: They have carried a majority of them in each of the past five presidential elections, reaching at least 56 percent in the past four. The other groups have defied the patterns elsewhere. Over the past five elections, Republicans carried Wisconsin noncollege white women only in 2004. Republicans have carried college-educated white men in four of those five elections, but their margin in 2012 (7 percentage points) was much smaller than nationally. Democrats have also generally remained competitive among the noncollege white men who have stampeded toward the GOP elsewhere, although that may be changing: Obama in 2012 collapsed to just 39 percent among them, down from 49 percent four years earlier. In 2014, Walker held Mary Burke to just 40 percent of noncollege whites overall, exit polls found. These groups have voted here in ways that confirm some national patterns and upend others. Democrats have won a majority of college-educated white women, ordinarily their best group among whites, in each election since 2000. But they also carried a majority of noncollege white women—usually a much tougher group for them—in each of those elections except 2004, when John Kerry essentially split with them with Bush. Republicans have carried noncollege white men here in three of the four elections since 2000, but by narrow margins until 2012, when they preferred Romney over Obama by 15 percentage points. College-educated white men have voted Republican four straight times, but since 2004, by smaller margins than nationally. Ohio: This is one dimension in which the Rust Belt is following national trends. Married men and women each were 34 percent of eligible Ohio voters in 1980 but only 26 percent in 2012. Over that period, single men increased from 14 percent to 22 percent of eligible voters, and single women spiked from 19 percent to 26 percent. Single voters have also increased their share of the actual voting pool on Election Day from 27 percent to 45 percent over that period. Pennsylvania: In 1980, married couples represented almost exactly two-thirds of eligible voters here, and singles were about one-third. By 2012, married couples equaled 53 percent of eligible voters, and singles had surged to 47 percent. Married couples retain a bigger advantage in the pool of actual voters, but even there the balance has shifted. Married couples were about three-fourths of voters in 1980; by 2012, they were three-fifths. Michigan: Likewise, married couples here have fallen from 66 percent of eligible voters in 1980 to 54 percent in 2012, while single men (rising from 15 percent to 21 percent of the eligible population) and single women (increasing from 19 percent to 25 percent) have both grown. The change has been more modest in the actual voter pool, with singles rising only from 30 percent in 1980 to 38 percent by 2012. Wisconsin: Singles have made greater advances here. In 1980, married couples represented two-thirds of eligible voters and 70 percent of actual voters. By 2012, they had slipped to 54 percent of eligible and 58 per cent of actual voters. Single men and women represent a comparable share of the eligible voting pool, but by 2012 the women significantly outnumbered the men (25 percent to 18 percent) among actual voters. Iowa: Married couples remain more prominent here than in the other battlegrounds. They account for 58 percent of eligible voters (down from 70 percent in 1980); single women now represent 23 percent of the eligible population, and single men are 19 percent. Married couples exert even more influence in the actual voter pool: They accounted for 64 percent of voters in 2012. Single women (at 21 percent) cast a much larger share of votes here than single men (just 15 percent), another thumb on the scale for Democrats. Ohio: The aging of Ohio is pronounced. From 1980 through 2012, residents older than 50 jumped from 35 percent of eligible voters to 44 percent, while rising comparably from 42 percent of actual voters to 53 percent. Looking forward, the model projects the 50-plus population will continue growing and reach half of eligible voters by 2040. While voters ages 40-49 are projected to remain steady at almost exactly one-sixth of the electorate, those under 40 are expected to shrink in number. They have already fallen from 50 percent of eligible voters in 1980 to 38 percent in 2012, and the model has them dipping to 35 percent by 2040. In the three elections from 1992 through 2000, Bill Clinton and then Al Gore carried Ohio's seniors each time, while running about even with the near-retirement population (50-64) in 1992 and 2000 and winning those voters decisively in 1996. But Republicans have carried Ohio seniors by double-digit margins in the three most recent elections. Critically, though, Democrats have remained competitive with the near-retirement generation (measured in the exit poll as between 45 and 64), losing them narrowly in 2004 and 2012, and carrying them in 2008. Though Democrats have run very well among Ohio voters under 30 in the past three presidential elections, staying close among older voters, even as their national support has plummeted in that group, looms as a critical challenge in this pivotal state. 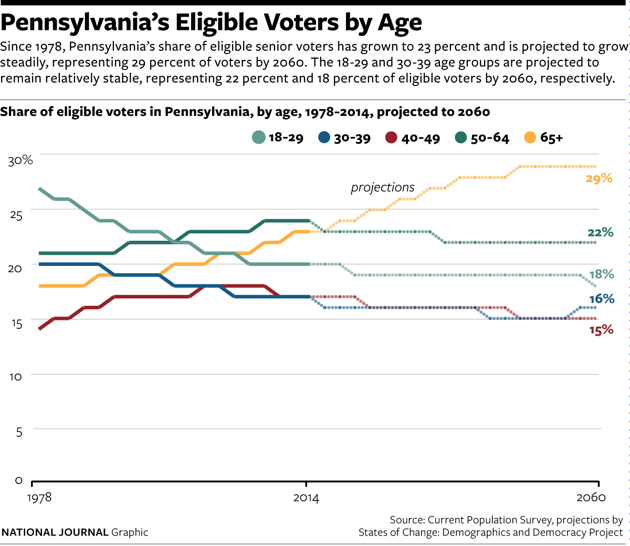 Pennsylvania: This has long been known as an older state, and the model forecasts it will remain one. Voters 50 and older represented 39 percent of the eligible population in 1980 and fully 46 percent by 2012. The model expects that number to rise to 48 percent by 2020, and then drift up to 50 percent by 2040, and 51 percent by 2040 before stabilizing. It expects voters under 40 to recede slightly from 37 percent of eligible voters in 2012 to 34 percent by 2040. In 2012, for the first time in the period studied, voters older than 50 cast a majority (52 percent) of the actual ballots in a presidential race. As in Ohio, Democrats have generally remained competitive with older voters here. They won Pennsylvania seniors in 1992, 2000, and 2004, and split them about evenly in 1996 and 2008. But reflecting national trends, Obama sagged badly with them in 2012, falling to 43 percent. Among the 45-64 cohort, he also slipped from a solid 55 percent majority in 2008 to a narrow defeat in 2012. Still Democrats are performing better with the broad pool of older voters here than elsewhere—and likely will need to continue to do so to hold the state. The party's performance among young adults is strong: Democrats have carried voters 18-29 in each of the past five presidential elections and reached at least 60 percent in the past three. 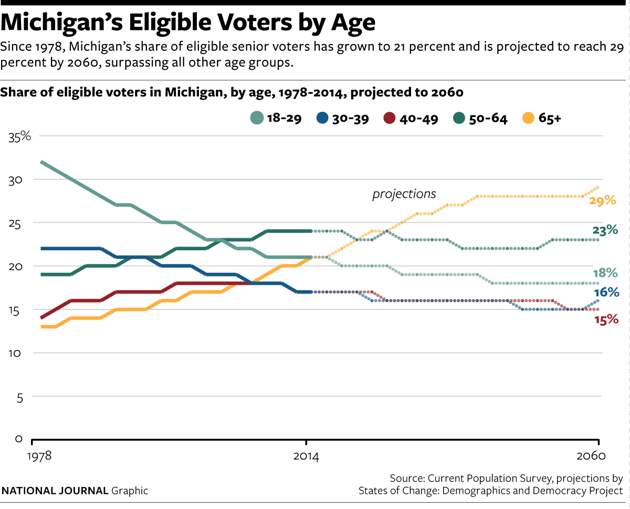 Michigan: The electorate here is even older. As recently as 2000, voters over 50 constituted only about two-fifths of the actual voters, virtually unchanged from 1980; in 2012, for the first presidential race in the period studied, those older voters cast a majority of all ballots (55 percent). That was well above older voters' share of the eligible population in 2012 (44 percent). 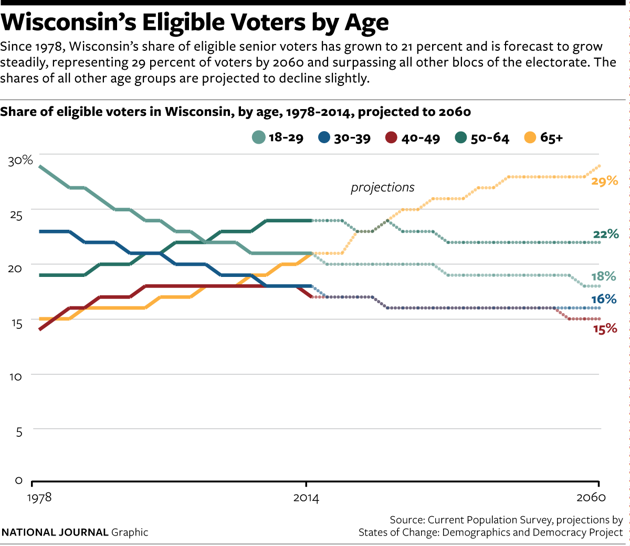 Looking forward, the model projects those older voters to reach 45 percent of the eligible population by 2016 and ultimately half by 2040—which would imply an even bigger presence in the pool of actual voters. The projection anticipates that adults under 40 will slowly recede from 38 percent of eligible voters in 2012 to 34 percent by 2040. Democrats have run extremely well among younger Michigan voters, carrying a majority of them in each of the past five presidential elections. (That's partly because the 18-29 year old eligible population is much more racially diverse than the older population.) But more important to their presidential success here is their continued competitiveness among older voters: in each election since 1992, exit polls have shown Democrats carrying at least a plurality of Michigan seniors, as well as 50 percent or more of the near-retirement generation, ages 45-64. Democrats have benefited because the state's current senior population includes many who lived through (even as children or young adults) the heyday of its union movement; maintaining that advantage won't be easy as they are replaced by future retirees less influenced by that tradition. One thing that won't change much is the state's racial gap between the generations: The States of Change model projects that even as late as 2040, whites will still comprise almost three-fourths of Michigan's near-retirement cohort and almost exactly four-fifths of the state's 65-plus population. By then, it expects minorities to approach two-fifths of the 18-29-year-old eligible population. Wisconsin: The state may bleed green and gold for its beloved Green Bay Packers, but gray is increasingly the defining color of Wisconsin, too. In 1980, voters under 40 represented 51 percent of eligible and 50 percent of actual voters; by 2012, they had fallen to 38 percent of eligible and only 32 percent of actual voters. Voters 40-49 increased over that period from 15 percent to 18 percent of eligible voters, and from 13 percent to 18 percent of actual voters. And those over 50 surged. In 1980, they were 34 percent of eligible voters; by 2012, that number was 44 percent. Among actual voters, they rose even more, from 36 percent to a 51 percent majority. The model projects steady continued growth in the over-50 share of the eligible population: from the 44 percent level in 2012 to 45 percent in 2016 and 49 percent by 2040. By then it expects those under 40 to equal only 35 percent of the eligible population. Iowa: The aging of this state is pronounced, too. In 1980, voters under 40 represented 51 percent of the eligible voter population; by 2012, that was down to 38 percent. The 40-49 population grew from 14 percent to 17 percent of the eligible population over that period, and the 50-plus cohort jumped from 35 percent to 44 percent. In 2012, the 50-plus group cast a 52 percent majority of all votes; back in 1980, their share on Election Day was just 39 percent. Looking forward, the model projects this wheel to steadily keep turning, with the over-50 population reaching 45 percent of the eligible pool in 2016, and 50 percent by 2040. 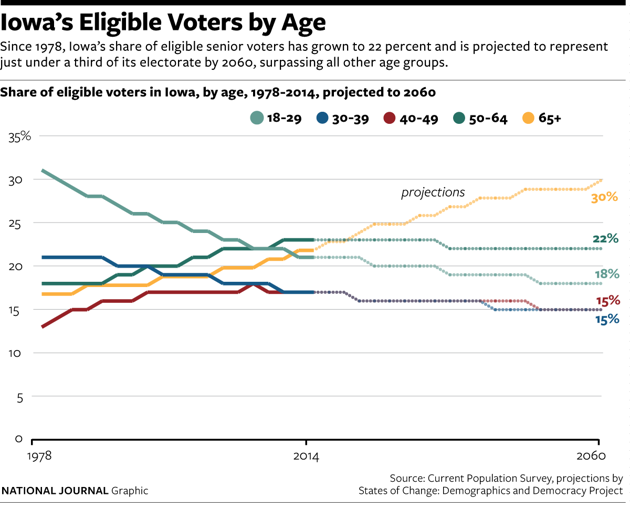 And while the state's young-adult population will slowly diversify—the model projects that minorities will constitute about one-fifth of the eligible 18-29 population by 2024 and over one-fourth by 2040—it anticipates that nearly nine in 10 Iowa seniors will be white even through 2040. Iowa's young adults have moved sharply toward Democrats since 2000. But the key for Democrats here, as across the Rust Belt, is remaining competitive among blue-collar and older whites at a time when their support among these groups has plummeted elsewhere. The Democratic presidential nominees have carried or run even among Iowa's seniors in each election since 1996, and also carried the near-retirement generation (45-64) in each of the past five elections except 2004. 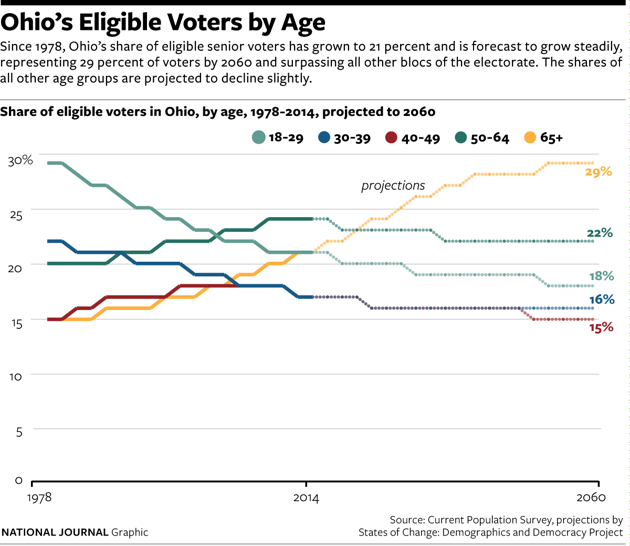 As throughout the Rust Belt, holding that support among older voters here will grow even more critical as the state's bumper crop of seniors inexorably expands.